This is the period of French colonial conquest and creation of colonial ruling institutions. A grasp of the politics and knowledge of events of this period is essential to understanding the backdrop to the French Indochina War. We begin with a look at the evolution of Vietnamese political culture, first as it evolved under the Emperor Gia Long and his successors, and then as it evolved under French rule. In painting a picture of any war the cultural differences involved must be depicted first, to provide the background upon which the characters and events can be set more clearly in context. The early part of the period we are reviewing is characterized by the competition for colonial expansion among the Europeans. The latter part of the period saw a struggle between nationalism and communism for the soul of Asia. In understanding the causes of the Indochina Wars and the terms upon which they were organized— who fought who, when and for what reasons—it is important to understand that in Vietnam cultural struggles had their own peculiar character. China played in important part as well, as it always had in Vietnam’s history, and it brought its own cultural peculiarities to the canvas. For instance, many of the most prominent Vietnamese actors in the struggle for independence, nationalist and communist alike, were introduced to the struggle as exiles in China and participated in the Nationalist Revolution and the beginnings of the Communist Revolution that paralleled it. It is important to try to get some feeling for what it meant to be Vietnamese, and how that changed over these important decades that saw the overwhelming introduction and institutionalization of French culture and administration. This paper is largely devoted to an attempt to come to grips with that phenomenon. Before moving on, we should take another moment to reflect on an important difference between Chinese and Vietnamese culture. It is crucial to understanding the Indochina story. China has had the single most profound influence on Vietnamese culture. Both are Confucian on the surface and look very similar to outsiders. But at a deeper cultural level there are profound fissures. One important split concerns the role of the soldier in the national psyche. Remember that soldiers sit near the bottom in the Confucian social order of things, but the Vietnamese embrace the importance of warfare and those who wage it far more directly than the Chinese. Therefore the soldier occupies a more prominent place in Vietnamese culture. Consider this: the greatest Chinese national heroes (pre-Mao) are all philosophers: Confucius, Mencius, Lao Tze. The great Vietnamese national heroes on the other hand are all warrior kings… and queens! In fact one of the most important foundation myths for all Vietnamese is that of the warring Trung sisters who led an insurrection against the Chinese in the first century AD. Dateline: It’s the end of the eighteenth century and the aftermath of the first Têt offensive…. 1) Reduce the status of the princess who was the legitimate claimant to the throne by making her a Vietnamese civil servant, a low-ranking government official. 2) They made a bureaucrat out of the queen, at least on paper. 3) They forced the Cambodians to wear Vietnamese dress and adopt Vietnamese hair styles. The Cambodians resisted fiercely and to some extent were able to retain strong traces of their culture. Needless to say there was no love lost for the Vietnamese. At the same time Thailand was coming into its own as a regional force to be reckoned with. For over a century the Burmese and the Thais had been locked in a hard fought struggle. The Burmese very nearly won, capturing and burning the Thai capital of Ayuthia in 1767, but the Thais escaped and relocated their capital to Bangkok. They quickly reformed their government under King Rama I. The ruler was acquainted with European ideas and hence their was a continental flare to the shape that government took. In the process, the Thais reinvented themselves as the first modern Asian nation state. When the British eventually arrived decades later the Thai state faired well since the Brits found it useful to have a friendly buffer state between their possessions in India and the expanding Dutch in Indonesia and the French in Indochina. As it turned out, both Japan and Thailand escaped the clutches of the European colonists, the only Asian nations to do so, and that fact by itself has had a profound effect on events in Southeast Asia ever since. Back in Indochina, recall that Gia Long overthrew the Son Tay dynasty with French military assistance. And though he was personally indebted to the French – he tolerated Catholicism for instance—he was also very wary of the foreign influence. This pattern as we will see appears again and again in the Indochina story and it is one worth keeping an eye on as we progress. As early as 1793, during his war against the Son Tay rulers, Gia Long petitioned the Qing emperor in Peking for recognition of vassal status. The Chinese did in fact accede to his request, but only after his final victory over the Son Tay challenge. The Quing Emperor recognized Gia Long’s royal authority in an imperial decree of 1803. In addition he decreed that the name of the country be changed from Dai-Viet, or the land of the Viets, to Viet Nam, the land of the southern Viets. The Vietnamese emperor, who is generally portrayed in Vietnam as the inheritor of a thousand year tradition of unceasing struggle against the Chinese, allowed a Chinese emperor to change the name of his country. In the end, regardless of what had led up to that moment, Chinese sponsorship was still required – it was after all the mark of legitimacy. So even in their shining moment of independence the Vietnamese were still beholden to their big brothers across the northern frontier. This love-hate relationship is embedded in the national DNA in Vietnam. It informs all that went before and all that was to come. Gia Long came to power at the end of a period of two centuries civil war, wars founded in dynastic instability. The new Emperor had no desire to see a repeat. Gia Long went to great lengths to eliminate challenges to his authority as a means of consolidating his hold on power. 1) He curtailed large land holdings by princes, nobles, and other high officials. 2) He abandoned the traditional practice of paying officials and rewarding nobles by granting them the power of taxation. Gia Long’s bestowal of political power on the mandarins was a turning point in Vietnamese history. How? Because the weakening of power held by the traditional ruling class and high court officials meant that no other group had the power to influence the government’s decisions at any level above that of the village chief and council of elders. The provincial governors reported to the emperor, the village chiefs reported to the provincial governors—in theory and increasingly in practice all of them mandarins—and the higher up things went, the more isolation there was from the bulk of the populace: the rice-growing peasants. That was to have powerful repercussions over time as the covetous gaze of the colonizing French increasingly turned in their direction. In 1816 Gia Long designated his son, Minh Mang, as his successor. The throne would pass from father to son; succession was determined not by age, but on the basis of the father’s preference. Minh Mang was favored by Gia Long, and the majority of his senior mandarins, because of his conservative tendencies and his grasp of the Chinese classics. Minh Mang was the most conservative of Gia Long’s possible successors. He assumed the throne on Gia Long’s death in 1820. One of his first official acts was to prohibit the use of the chu nom Vietnamese script in official documents. From then on, all government correspondence, edicts, laws were in Chinese. But Chinese learning was practically unknown to anyone in Vietnam outside of the Mandarins. The decision to use Chinese as the sole instrument of governance effectively severed the relationship between the people and the government. This situation of alienation left the Vietnamese in a vulnerable position. Because there was so little social cohesion they failed to effectively resist the French when the time came to do so. And all that has come since, everything that makes up contemporary Vietnam, is rooted in that failure to turn back the French. It was Tu Duc’s misfortune to be on the throne when the French finally arrived in force. He was a victim of bad timing. We know that the Vietnamese had fire arms including muskets and European style muzzle loading artillery. And we also know that they were not lacking in courage. But they did not have disciplined military units in the European sense and they certainly didn’t have the big guns and firepower available to the French, who had the power of the industrial revolution behind them. From village level up, the individuals who actually ran the country were of the Mandarin class. At village and hamlet level, local mandarins ruled in consultation with councils of village elders, but the authority rested with them flowing down from the emperor. They were the officials who settled land disputes. They were the officials who levied taxes. They directed public works projects. There was also a class of wealthy land-owners– known as gentry-scholars– who were educated in the Chinese classics and who had significant economic and political power at their disposal, especially at the local level. As it happened, these folks would be the ones in the vanguard in resisting the French. They may have had an advantage over the mandarins in this respect because they did have an organizational structure connecting them to one another but they were free of any chain of command linking them to imperial authority. The mandarins were selected and promoted on the basis of linguistic ability.Their spoken language was Vietnamese when dealing with their subjects, but when it came to communication among themselves, at least in written form, it was in Chinese. To be a mandarin you had to master five thousand Chinese characters. That’s an impressive intellectual achievement. The system was informally institutionalized: many retired mandarins set themselves up to teach and encourage young men who wanted to become mandarins. Unsurprisingly, a high percentage of mandarins were the sons of mandarins and the class became inbred and increasingly isolated from broader society. Where did soldiers fall in the scheme of things? They were basement dwellers. Right up there with prostitutes. By the time the French arrived Vietnam’s centralized form of government had successfully insulated Tu Duc and his predecessors from dynastic challenge for years, but it did not always prevent bottom-up internal rebellion. In fact, there had been numerous internal rebellions against the mandarin rulers, notably in the Mekong delta, usually they were triggered by inequities in taxation and land allocation. So the country was anything but unified when the European ships appeared on the horizon. The appearance of the French was an ominous development indeed. Unfortunately for the Vietnamese their mandarin leaders had been nurturing a dysfunctional state primarily designed to keep their own kind in power. They had cut themselves off from the bulk of the population. As a result they were hardly in the position to rally the people to come together and fight to the death against a foreign foe bent on conquest. The French were looking for colonies in the mid-1800s. Economic aggrandizement had traditionally been the motivating factor for the colonial conquerors, India had been quite lucrative for the British for instance, but in the case of Indochina money seems not to have been the primary factor. And as we now know France’s Indochinese interests never amounted to much economically for the home country. So why then? For one thing, the French needed to have foreign holdings to keep up in the race for international prestige. The country’s power and influence had been on the wane since the fall of Napoleon and the Indochinese peninsula was ripe for the picking. So they set out to bring the blessings of French civilization to the the poor savages who didn’t know any better. Then, after gaining some solid momentum, they were humiliated militarily in the Franco-Prussian War (1870-72). Territorial expansion served two distinct purposes for the French in the aftermath of that lost war. First, a place was needed to settle the hundreds of thousands of refugees who were forced to flee when the Alsace-Lorraine region was awarded to the Germans as the spoils of war. Most migrated to Algeria but many were resettled in the Asian colonies. Second, the French were looking for ways to restore their national pride. A popular way of bolstering national pride at the time, reflecting the widespread belief in social Darwinism, was to acquire a colonial empire, and the French dove in with gusto. For the French in Vietnam, rice was an attraction. But interestingly rice never made much money for the French. In fact, while rice was the number one export of Vietnam, both before and during French rule, it was almost all exported to China and the profits went to the Chinese merchants who controlled the trade. They started out in North Africa, in Algeria. They then established protectorates over Tunisia and Morocco and they expanded into the Sub-Sahara. Between the French, the British, the Portuguese, and the king of Belgium they pretty well carved up Sub-Saharan Africa. What did the French get out of North Africa and their Sub-Saharan colonies? To a certain extent their balance of trade actually deteriorated. They did get raw materials; forest products from the Gold Coast for example. One of the most important materials mined by the French in their African colonies was soldiers. They recruited long term professionals who were willing to fight for a paycheck that was small by European standards. They were acclimated to the tropics and tropical diseases—and that was critically important in the days before sulfa drugs and penicillin—and, indeed, most of the first French soldiers to go to Indochina were North Africans and Sub-Saharan Africans– Algerian, Moroccan, and Senegalese– with French officers and NCOs (non-commissioned officers). There were plenty of Germans in the Foreign Legions as well. We have described the limited but steady contact between French explorers and the Vietnamese and how that grew steadily as time wore on. By mid 19th century many French naval officers, merchants and missionaries were actively lobbying Paris to consider embarking on a full-blown colonial enterprise in southeast Asia, namely in Vietnam. The straw man they created to justify the action was none other than Tu Duc himself, and his anti-Catholic policies. Going back to Gia Long, the Nguyen emperors had always been wary of Catholicism. At the same time, they were well aware of European military superiority. They had always been extra careful not to interfere with foreign missionaries. Meanwhile these same emperors and their mandarin subordinates were often ruthless in their suppression and persecution of indigenous Catholics—Tu Duc issued a secret anti-Catholic decree in 1851 that may have resulted in the death of as many as 30,000 Vietnamese Catholics over six years. But they were very careful to keep their hands off foreign priests. Then in 1856 Tu Duc broke with tradition by executing a Spanish priest, Monsignor Diaz. This action had tragic consequences for Vietnam. It gave the French their excuse. The French used Diaz’s execution to justify intervention. They threw in with the Spanish on a joint expeditionary force. In August 1858 a joint Franco-Spanish invasion fleet entered the harbor at Da Nang. Clearly the French were in charge– a French admiral, Rigault de Genouilly, was in command. The imperial government was based in Hue, which is reasonably close to Da Nang. Hue was the Vietnamese equivalent of Peking: the center of the universe. To the untested French commanders attacking Hue from Da Nang seemed logical. After all if you already believe you are superior it is natural to take the exercise lightly and ignore the possibility of unseen obstacles. That is just what the French did. So they landed at Da Nang and quickly realized that they lacked the small boats needed to transport the troops up river to Hue. They became stranded in the lowlands near Da Nang. The French and Spanish troops weren’t prepared for guerrilla warfare. More urgently, they weren’t resistant to the new diseases they faced. Genouilly’s plan entailed withdrawing the bulk of his forces from central Annam, then seizing Saigon. That would give the French control of Indochina’s most important sea port and cut the emperor in Hue off from his rice supply, most of which came from the lower Mekong Delta. Feinting a retreat, he pulled his troops from Da Nang. To the jubilant Vietnamese it looked as if the foreign invaders had been banished. It was not to be. The French wheeled and seized Saigon on 17 February 1859 and declared the port open for commerce on the 22nd. By April they were gone except for a small garrison: 600 French troops– Senegalese and Algerians with French officers, and 250 Spanish. After suffering massive losses to cholera that summer, they received 1,000 reinforcements. Largely unmolested by the Vietnamese, they supported themselves by levying import and export duties on commerce. There was a small naval squadron to keep the Saigon River (the Song Sai Gon) open for commerce. It is worth noting that the French received a disappointing reception from local Catholics. They expected help, or at least gratitude, but it didn’t happen. It shouldn’t be surprising though, clearly Catholics were gun-shy after severe crack downs by the Tu Duc regime. The tiny Franco-Spanish garrison was able to hold on to Saigon for an extended period. It is instructive to consider how a small garrison could have controlled Saigon for so long while being outnumbered by tens of thousands. Understand that traditional Asian notions of sovereignty were very different from ours. Our notion of sovereignty is a product of Europe and the Age of Reason. It’s based on the idea of nation states defined by hard, geographic boundaries: you live on one side of the border and are ruled by the political entity whose writ prevails on your side. You either are or aren’t a subject of a particular polity, no shades of gray. In traditional Asian concepts, sovereignty was not absolutely determined on a geographic basis, but emanated outward in circles of authority that decreased in intensity as the distance from the center of power increased. If you were far enough from the center you paid more attention to local powers than to the emperor. It was on that basis that the tiny French garrison survived in Saigon; far from Hue, and armed to the teeth, they were the local power. The fact that he was facing a powerful enemy was not lost on TuDuc. It was an enemy he did not wish to anger. Saigon was a long way from Hue. And so he waited. Then in February 1861, the French came back in strength, a major expedition of 70 ships and some 3,500 men under Admiral Leonard Victor Joseph Charner. No more messing around with Da Nang; they were after the big economic prize: Saigon and the rice-growing regions that surrounded it. They blasted their way up the Son Sai Gon and on February 26-27 they engaged a Vietnamese army of 22,000 commanded by a court mandarin. The Vietnamese were dug into prepared positions at Chi Hoa covering the approaches to Saigon. They put up a desperate fight, but in the end they were unable to stand up to French artillery and were put to rout by disciplined infantry. It was a total mismatch despite the fact that the French were heavily outnumbered. Tu Duc recognized that he couldn’t fight the French on their own terms—meaning in open battle—so he tried to bribe them by offering them outright sovereignty over several provinces in the immediate vicinity of Saigon. The thought of supporting the ongoing guerrilla resistance seems never to have occurred to him. It was being led by peasants and the scholar-gentry– that would have been a terrible affront to his Confucian sense of social order and hierarchy. He was further motivated to settle quickly by the outbreak of a major rebellion against his rule in Tonkin, which he considered the greater threat to his legitimacy. So in June of 1862, just as the French were reaching the limits of their ability to contain the challenge in the south, Tu Duc called a truce. It was a disaster of timing. Many ordinary Vietnamese ignored the truce, continuing to resist the French, only to be cut down only by an incredibly bloody campaign that took several years. In April of 1863, Tu Duc received Admiral Louise Adolphe Bonard, Charner’s replacement as French commander-in-chief, and Colonel Palanca, the senior Spanish representative, in the Imperial Palace in Hue. There they ratified a treaty. In a telling detail, the Europeans were not required to prostrate themselves before the Emperor as protocol demanded and were permitted to retain their swords in the Imperial presence. The French were granted sovereignty over the provinces of Bien Hoa, Gia Dinh and My Tho, plus the Puolo Condere islands. They also received trade concessions, rights of passage up the Mekong to Cambodia and payment of a large cash settlement. Tu Duc had cut a deal with the Devil. The game was on. French aggression gained momentum. Next in their path was Cambodia. In 1863 they coerced Prince Norodom, at the point of the gun, into declaring his country a French protectorate. Norodom remained in power, but he would govern under French direction. In internal matters he was allowed wide autonomy, but he was forced to cede all control of foreign affairs and defense to France. This model would be employed again in Vietnam many years later in the guise of Bao Dai. The French also attempted to impose such a settlement on Ho Chi Minh in the 1940s, with less than desirable results. From the Cambodian point of view the arrival of the French was a mixed blessing. To be sure, ordinary Cambodians would be subjected to the same kind of economic exploitation that dogged the Vietnamese peasants, but at least Cambodia would continue to survive as a political and cultural entity. Cambodia would surely have ceased to exist if the French had not arrived when they did. Just as Champa had been absorbed by the conquering Viets earlier in the century, Cambodia was in then in danger of also being absobed by Vietnam, and Thailand. Like the Chams, the Cambodians would have seen their best land expropriated by the raiders and would have become a downtrodden minority in what had been their own country. Instead the French froze the political borders. For the moment, the political elites in Cambodia concluded that French dominion was preferable to being culturally absorbed by the Vietnamese or the Thais. Back in Vietnam, armed resistance to French presence in South Vietnam was sporadic but it did continue for the better part of twenty years before finally fading out. Freed from that burden the French turned their gaze northward toward Tonkin. By 1873, the French were making inroads into Tonkin. The first incursion was in the form of a private expedition by French merchants who were trying to open a trade route with China along the Red River. They came into Hanoi from China and when the local mandarins proved uncooperative they seized the town and called for help from Saigon. It did not come. The French Minister of Colonies at the time, Paul Louis Phliastre, was a relative liberal in dealing with the “natives” and as such was not inclined to hawkish behavior. In addition, there was uncertainty in Paris as to whether Tonkin was in the French zone of influence or the Spanish. In the summer of 1883, with Philastre out of office, the French moved back into Tonkin. This time they came with full intentions of taking total control and declaring Vietnam a protectorate of the Empire of Annam, but with foreign policy and defense under French control. This led to an extended, low grade, Franco-Chinese war. The situation was further complicated by the eruption of a rebellion in China by a group called the Taipings. The Taipings fought under the banner of Christianity. The Chinese were successful in suppressing them, but Taiping remnants, the so-called Black Flag Bandits, fled across the border into Tonkin where they gave the French fits for years. For their administrative convenience and to distance their rule from past actions, the French divided Vietnam into three parts. Tonkin in the north, Annam in the middle and Cochinchina in the south. Each had a different legal character and each was ruled differently. As a colony, Cochinchina was an outright French possession, directly ruled by a French governor-general in Saigon. Its citizens were French subjects. Annam was an empire governed from the imperial palace in Hue, albeit on French terms. Tonkin was a protectorate of the Empire of Annam ruled by an imperial Viceroy in Hanoi, also on French terms and at French mercy. What about Laos? We have heard plenty about Cambodia and Vietnam. So what was happening in the mysterious isolated land beyond the Annamite Mountains? The French got into Laos by virtue of innate curiosity and because Laos was at that time experiencing a power vacuum. Initial French exposure to Laos was in the form of expeditions up the Mekong looking for advantageous trade routes. The Mekong turned out to be non-navigable for much of its length but the expeditions came back with spell-binding travel stories. Then, in 1887, August Pavié, an official of the French postal and telegraph service, went into Laos looking for opportunity. There he befriended the Laotian king, Oun Kham. But shortly after Pavié’s arrival, the king got caught up in a struggle between the Thais from the south and T’ai tribal elements from northwestern Tonkin. Pavié managed to spirit Oun Kham out of town in a pirouge (a long skinny rowboat), one step ahead of T’ai raiders. They made it down the Mekong, saving the king’s life. Out of gratitude, and necessity, Oun Kham requested French intervention. The French were only too happy to come to his aid. There wasn’t much military muscle in Laos, Thai or T’ai, so in 1893 the kingdom of Laos became a French protectorate. A Franco-British treaty established the Burmese-Vietnamese border at the Mekong in 1886,. The following year a Sino-French treaty established the northern border with Tonkin. In 1907 the French forced the Thais to cede everything on the east side of the Mekong as well as sizeable chunks of territory west of the Mekong at the Burmese border, and in the extreme south near Cambodia. Those boundaries largely remain today. At this point a few words are in order about French concepts of governance. Like the US Congress, the French National Assembly is composed of elected representatives and performs the same basic legislative functions. Further down, provincial governors and local prefects are civil servants appointed by the central government in Paris. They enter civil service by competitive examination and rise in the ranks in a military-like promotion system… not entirely unlike the mandarin system. By the period of our concern a very high proportion of senior government officials were graduates of a handful of elite schools. The result was a centralization of authority and its removal from popular control. French concepts of law and justice are based on the authority and legitimacy of the government. There is a single, national, system of justice. There is no presumption of innocence until proven guilty.There is no trial by jury. Judges are appointed by the central government, not elected. They serve as their own prosecutors with wide powers of detention and investigation. By contrast, our system, based on English Common Law, derives its legitimacy not from the power of the state, but from popular sovereignty, that is, the consent of the governed. Accused criminals are assumed innocent until proven guilty and are entitled to trial by a jury of peers. Courts’ powers of detention are constrained and writs of habeus corpus are routinely granted. Our justice system is split between an appointive Federal judiciary and elective state and local judiciaries which handle the vast majority of our legal affairs. The Sûreté was a direct descendant of Napoleon’s brutally effective internal security apparatus run by the notorious Joseph Fouché. It was primarily concerned with political rather than criminal matters. During the period under review, it controlled small armies of inspectors and agents, overt and clandestine. Secret informants operated with few legal constraints. This was particularly true when dealing with non-French citizens. Seemingly blind to the underlying motives that brought indigenous peoples into conflict with the colonial regime, the Sûreté could be remarkably efficient and effective. In the long run its tactics became increasingly controversial. Tu Duc died childless in 1883, leaving the empire in the hands of a council of regency. In that same year the French had consolidated their hold on Tonkin. A twelve-year old boy, Ham Nghi, was enthroned as a symbol of sovereignty but the regents were really running the show. The council however was torn by internal divisions. After a period of power struggle control of the council was assumed by a mandarin named Ton That Thuyet, a staunch opponent of the French. In 1885, Ton’s persistent objections to the colonists seizure of Tonkin so inflamed the French authorities that it prompted them to dispatch an expedition to Hue to teach him, and the boy emperor Ham Nghi, a severe lesson. Clearly Thuyet had no sense of proportion in this matter– he completely misjudged the French military capacity— so he ordered an attack on the approaching French forces. The Viet counter-attack was put down ruthlessly and French Marines captured, looted, and burned part of the imperial palace. Ton That Thuyet was forced to flee into Laos, spiriting away the boy emperor with him. From there Ton issued a proclamation in the Emperor’s name– called Can Vuong (Loyalty to the King) Edict. It called for resistance against the French by all means necessary. It was aimed at scaring up support from scholar gentry elites—it was written in Chinese for example—and called for widespread rebellion against the foreign usurpers. Unfortunately for Ton and Ham Nghi, the bulk of the imperial household summarily abandoned them and stayed in Hue, choosing collaboration with the French and the comforts of the imperial palace over resistance. A puppet emperor was enthroned soon thereafter by the new French overlords. Nonetheless the Can Vuong uprising did find widespread support, but it had a serious flaw in that it was led by scholar gentry. Their power and influence was purely local. Unlike the mandarins, they had no chain of command to the top. Their uprisings were always poorly coordinated and the French were able to take them down one by one. To add, the French were successful in recruiting many Catholics, who remembered the purges carried out by the mandarins against them. Large numbers of Catholics (many indigenous) were more than willing to assist the foreigners against their traditional oppressors. Ham Nghi remained at large until he was sixteen years old. Then, in November of 1888, he was betrayed to the French by a Muong tribesman in his entourage and captured. Ton Thanh Thuyet’s son, also sixteen, died at his emperor’s side. Ham Nghi was sent off to exile in Algeria, refusing to communicate with the French or acknowledge his name. The French began by co-opting local elites, beginning with the mandarins. The mandarins were already responsible for collecting taxes and organizing corvée labor—forced labor provided to the government—at the provincial and village level, an arrangement the French left unchanged. They kept the mandarins firmly under control by forcing them to remit taxes directly to the colonial government and by making the mandarins salaried employees of the French regime. The French then established a parallel system of governance in which indigenous authorities were paired with French résidents. These were officials who monitored and supervised their native charges. Once the system was fully in place, the Emperor of Annam and the Kings of Cambodia and Laos governed in tandem with French résidents superieurs who were answerable to the French governor-general in Saigon. The same system prevailed in the provinces– mandarins wielded power at the district and village level, but under the orders of provincial mandarins who were firmly under the direction of their French résidents. The French quickly abolished the traditional Chinese language examinations for selection and promotion in Cochinchina. Under French pressure, the imperial government abolished them in Annam in 1915 and in Tonkin in 1918. French was decreed to be the official language of the bureaucracy, although traditionalists in the imperial court still insisted that officially approved schools for would-be mandarins continue to provide instruction in Chinese, which they did. Economic exploitation advanced hand in hand with the consolidation of political power; the French gave control of large swaths of rice growing land in the Mekong Delta to Frenchmen. Many former land owners were reduced to landless laborers, working at the behest of French landlords and their Vietnamese overseers. The process was accelerated by French taxation policy, which replaced taxes in kind levied at the village level with monetary taxes levied on the individual land holder. This process undercut the authority and prestige of traditional elites and was particularly corrosive in areas with a large exportable rice surplus. Events were facilitated by an economic strategy designed to divide and conqueror in which the French pitted local Chinese merchants against Vietnamese merchants. The rice-growing peasant existed on the margins in the best of times, and if a bad harvest forced him to consume his seed stock to survive he was forced to the Chinese money-lender to obtain the cash needed to purchase seed. The rates of interest were ruinous and his only collateral was his land. Barring a bumper crop the next year, he would be forced into foreclosure and his land forfeit, falling into the hands of wealthy landlords. He and his family became members of a swelling class of landless workers, ripe for exploitation. The situation was worsened by the demand for cheap labor by French business, particularly rubber plantations in Cochinchina. Labor was needed elsewhere in the colonies as well, including plantations in overseas possessions, notably New Caledonia, and in coal mines in Tonkin. The labor market was mined by French contractors who signed landless Vietnamese to labor contracts under false promises to work under conditions that amounted to slavery. The French employed more bureaucrats in Indochina than the British did in India. All this to govern a population over a hundred times smaller! The British—the contrast is telling—delegated significant authority to local elites and allowed local maharajahs to exercise genuine power. To be sure, the British dictated foreign policy, but the maharajahs had genuine power– right up to Independence in 1947. Many units of the Indian army were commanded by Indian officers at every level. By contrast, essentially all the officers in the French colonial military establishment were French, and most of the non-commissioned officers (NCOs) as well. In another telling difference, the British required that officers in colonial units be able to speak to their soldiers in their own language, Hindi, Ghukali or whatever. Some French officers learned the language of their troops, particularly Arabic, but soldiers under French command were required to speak French. The question of military organization raises some issues that bear on our unfolding story. Like the British, the French subscribed to the theory of “martial races”, the idea that certain non-European nationalities made superior soldiers, though none as good as white European troops of course. The French considered Algerians, Moroccans and black Senegalese to be first rate military material. They looked down on the Vietnamese, but for some reason considered the Cambodians decent material. During World War I, somewhere around 90,000 Vietnamese were conscripted and sent to Europe where they served on the western front, suffering around 10,000 casualties. 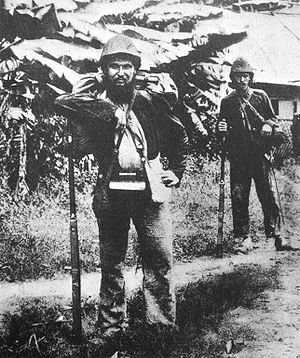 The majority were conscripted as manual laborers, and frequently even the Vietnamese soldiers were employed as labor troops, ditch diggers and coolies. It wasn’t just raw power: there were aspects of French culture that many Vietnamese came to respect, like the ability to build things, roads, railroads and later on electrical power plants, and above all education. And there were Vietnamese who found it in their self interest to go along with the French, particularly in Cochinchina where the French significantly accelerated the rate of economic development. There, a statistically small but economically important Vietnamese middle class emerged that was favorably disposed to French culture, spoke French and educated its children, at least in part, in French schools. Yet, most Vietnamese resented French rule and detested the French, but the number one priority for the overwhelming majority of Vietnamese was to grow enough rice to make it through the year to the next harvest. If all went well, you could have a good Têt and celebrate your prosperity, modest though it might be, drink a little beer or rice wine, prepare a proper feast and set off firecrackers to drive away the evil spirits. French colonists tended to be businessmen, bureaucrats and soldiers, sent out as individuals rather than in family groups. In many cases the French emigrants married local women, mostly Vietnamese. In most cases, indigenous wives and children of Frenchmen were granted French citizenship. But from the French perspective the Indochinese empire was a major disappointment. Far from providing fat profits through capitalist exploitation, Indochina absorbed more in government spending on bureaucrats’ and officials’ salaries, military expenditures, and the cost of maintaining a police state than it yielded in profits. The question of how to make France’s Indochinese possessions turn a profit was a major problem for the National Assembly. They sought to solve it by appointing Paul Doumer governor-general. Doumer held the post from 1897 to 1902 and gave the colonial regime its definitive shape. Paul Doumer was known for competence and abrasive outspokenness. A strong believer in order and efficiency, he went to Indochina determined to promote economic development and with a charter to balance the budget. He began by further curtailing the power of the Emperor, abolishing the Imperial Privy Council and replacing it with a royal council chaired by the Résident Superieur in which each Vietnamese member had a French counterpart. He then took all powers of taxation from the imperial government, making the emperor and his charges totally dependent on the colonial government. The fiction of imperial authority and legitimacy was preserved, but as always the French were in change. Doumer’s economic reforms were at the heart of his program. He increased the land tax paid by each householder. Most important, he imposed government monopolies on salt, alcohol and opium, turning the sale of each over to a concessionaire who ran the monopoly for profit and remitted the balance to the government. Of these, the salt monopoly was the most resented. Salt was essential to food preservation and was a principal ingredient in nuoc mam, the fermented fish sauce that is the universal Vietnamese condiment and seasoning agent. The alcohol monopoly was problematic in a different way. Rice wine was not only important for dietary reasons, but had important social and ritualistic uses as well. Consumption of rice wine before the family alter and at harvest and planting ceremonies, weddings, and so on was important for religious reasons. Home-distilled rice wine was one of the few luxuries that ordinary peasant households could afford, and outlawing its production and forcing the peasant to purchase from the monopoly at inflated prices placed a burden on those least able to afford it. The monopolies were regressive in that they hit those on the bottom rungs of the social and economic ladder hardest; they were also inherently inefficient and corrupt. They were inefficient in that the concessionaires worked at least as hard to increase their profits as to increase the tax yield. They were also inefficient in requiring constant police activity to enforce them. Given the ease of distilling rice wine for example, a considerable amount of police time and effort was spent in enforcing the monopoly and in incarcerating those accused of illegal fermentation. The monopolies were corrupt in that there was constant competition to secure and retain the concessions, with under-the-table payments to government officials the norm. Note: faced with constant competition and corruption, the French eventually turned most opium distribution over to criminal syndicates. But that was years away. The monopolies did in fact have the desired economic effect. Doumer was able to balance the budget, albeit at considerable human cost. Having done so, he embarked on a massive program of economic development, building public buildings and roads and, most important, constructing a meter-gauge railroad system running the length of Vietnam from the Chinese border with a parallel system of hard-surface asphalt roads, bridges and the accompanying infrastructure. The bridges were particularly impressive, notably the bridge over the Red River at Hanoi named for Doumer himself– it is over a mile long. It would survive repeated bombings by American planes decades later. All of this was done with forced corvée labor of course, organized by provincial and local mandarins. The French engineers and overseers made nice salaries, but the laborers who moved the dirt, spread the asphalt and laid the rails were paid nothing and even had to provide their own food in some cases. There was nothing new about corvée labor in Vietnamese society. It was the traditional means by which canals were dug, flood control works erected and maintained and so on, but the results were of direct benefit to ordinary peasants. By contrast, the infrastructure constructed by the French had little or no benefit to the ordinary citizen; rather it benefited French economic interests. The effects of Doumer’s policies varied from region to region. In the Red River Delta, there was little surplus of rice or anything else. Since there was no surplus for export, there was no incentive for the big landowners to move in. In the south where there was a considerable surplus, so the big proprietors took over and the small landowners were forced off the land. Many if not most ordinary peasants lived in landless penury and the village councils who previously ran things were discredited. The result was wrenching social dislocation and a breakdown of traditional values. To sum things up, the French theory of colonial exploitation held that the colonies should enrich the mother country, but all Paul Doumer could do was to bring self-sufficiency. He could raise enough through his taxes to support the cost of the huge bureaucracy and that was about it. The French talked about their civilizing mission, but in fact the result for the peasant was social dislocation and impoverishment. The French did build up the economic infrastructure—railroads, bridges and the like—but by and large it benefited only the wealthy and the French themselves. Buttinger, Joseph. A Dragon Embattled, Vol 1.